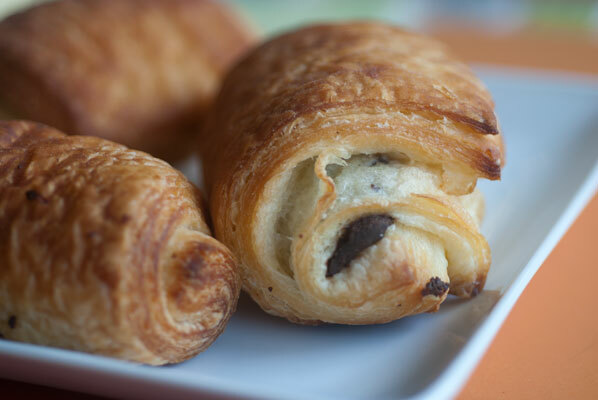 There is a bakery in this city that makes a delicious, small, buttery, flaky chocolate croissant that is to die for. They also don’t make very many of them, wisely not wanting to be stuck with day-old croissants, and increasing their appeal by their very limited daily quantity. I make a pilgrimage into that bakery whenever I am down on Granville Island: the reason is often an audition, and I have on occasion walked into said audition with delicate crumbs and morsels of melted chocolate clinging to my mouth. This is very bad form, especially if reading for a high status character. Fortunately, I don’t often get called for those roles – perhaps this is why. I relate this to my acting students as a cautionary tale: always check your appearance in a mirror before you enter the audition room. I have been a lover of bread and chocolate eaten together, in one form or another since childhood. One of my favorite after school snacks, made while Mum was at work, was a slice of buttered toast cut into four triangles, with a mug of hot chocolate. And yes, it was necessary to dip the toast into the hot chocolate, resulting in little buttery blobs on the surface of the drink, and lovely bendy chocolaty toast. The perfect accompaniment to several chapters of my newest library book, I procrastinated even then, putting off doing my homework until the last possible moment. It is starting to feel like fall outside. In a return of affection for my oven, which I eschewed in the dog days of summer, this is perfect bread baking weather, as I can get out for brisk walks in the crisp air between the rising/punching down … or I can read a few more chapters. So this week, I am baking bread with great lashings of chocolate melting in its depths, in homage to those bygone after-school snacks. They will be a sweet end-of-the-first-full-week-of-classes treat for Elder Son, who has just started post-secondary … and looks a bit shell-shocked. 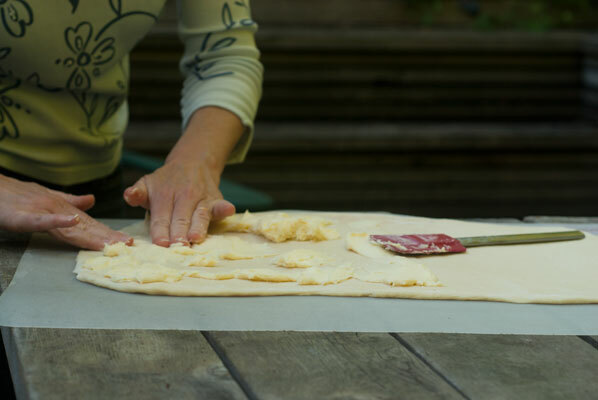 To get myself warmed up to the yeast bread, I am having a go at a recipe I have been meaning to try since the early 1980s, when I first encountered the recipe. A quick bread (not yeast risen, but using baking powder and soda as leavening agents), it is called Icelandic Potato Loaf. The recipe calls for unseasoned mashed potatoes in its ingredient list. 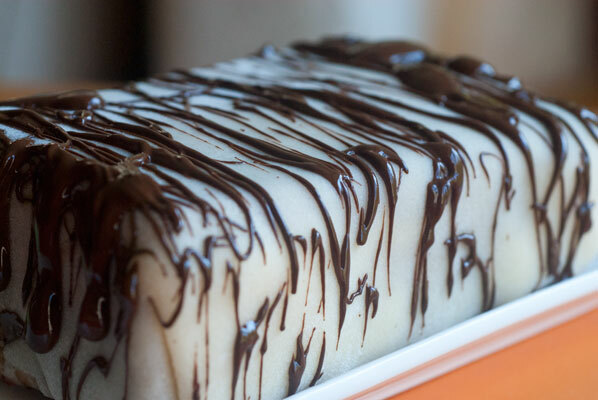 Covered with marzipan, studded with chocolate chunks and drizzled with melted chocolate, it is delicious eaten at breakfast with a cup of dark coffee. I should note: I inadvertently omitted the sugar in this recipe (not the first time I have done this while making a cake), and although the dough was not nearly so elastic and cooperative, when folding in the egg whites (I actually used my hands to fold in the egg whites), I have to say it did not really affect the taste, as the sweetness of the jam and marzipan made up for the lacking sugar. I am sure it did affect its tenderness, so I really wouldn’t suggest leaving the sugar out entirely, but you could safely cut it by fifty percent, I think. with parchment paper. 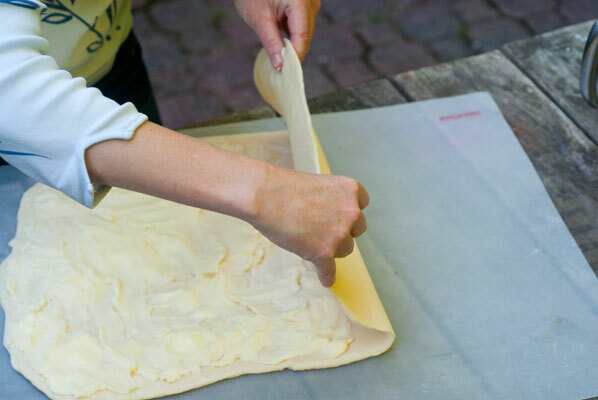 Sift together the flour, baking powder, baking soda and salt; set aside. 2. Cream butter until fluffy. Blend in mashed potatoes and sugar. Add egg yolks one at a time, and mix until very creamy. 3. In three additions, add the flour mixture, alternating with the yogurt, ending with the flour. Add vanilla, almond extract, ground almonds, and the chopped chocolate. 4. In a clean bowl, beat the egg whites until stiff. Fold the whites into the batter. Pour the batter into the two tins. Bake for 35-40 minutes, until the top springs back when touched. 5. Cool the loaves in their pans on a wire rack for 15 minutes. 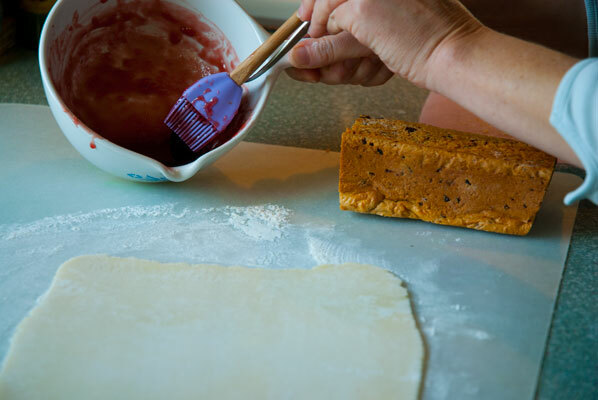 Run a knife along the edges of the pans to loosen the loaves, then invert the loaves onto the rack. 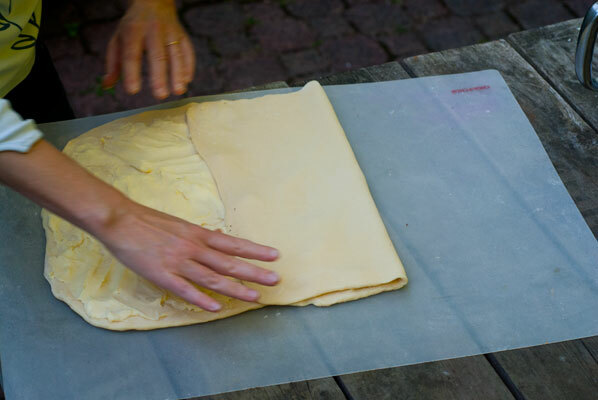 Loaves may be trimmed to create a flat top for covering, if desired. 6. 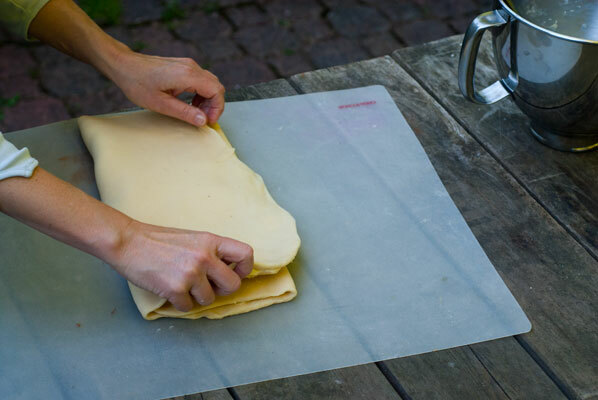 Cut marzipan into two equal pieces and roll out, between two sheets of parchment paper (or two Silpat mats) to create a thin rectangle, which can be draped over the cake. 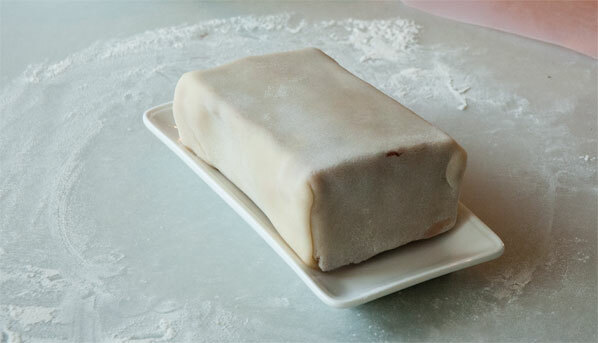 Place a cooled cake over one of the marzipan rectangles to check its dimensions. 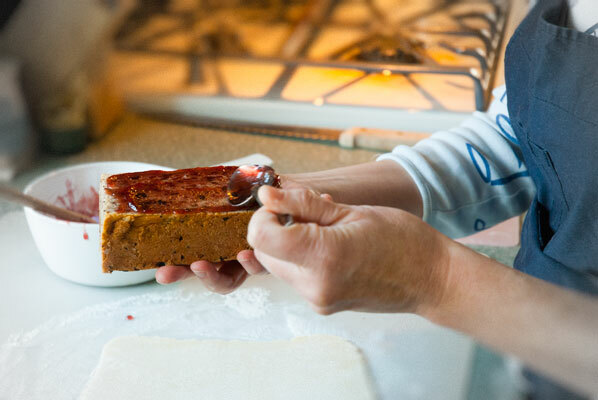 When you are satisfied that your rectangle will cover all sides of the cake, brush the top and sides of the loaves with a thin coating of melted jelly (heated gently in a saucepan). 7. Drape a marzipan rectangle over one of the cakes and smooth the marzipan down the two long sides, pressing slightly to have the marzipan adhere to the cake, smoothly. 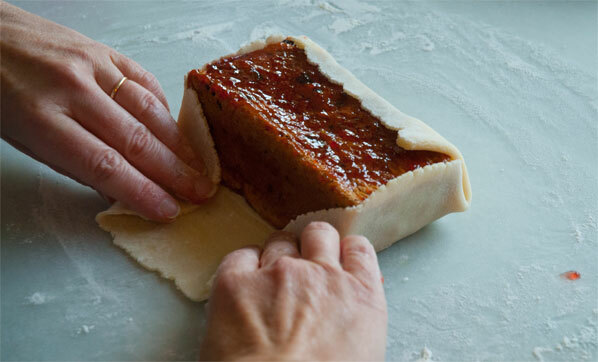 Tuck the ends of marzipan under the bottom of the cake, to meet underneath. 8. Fold in the short ends as though wrapping a package, which will create more bulk on the ends, but smooth the seams with your wet fingers (the coating is quite thin, so this shouldn’t be difficult). 9. Tuck end of marzipan under the bottom of cake. 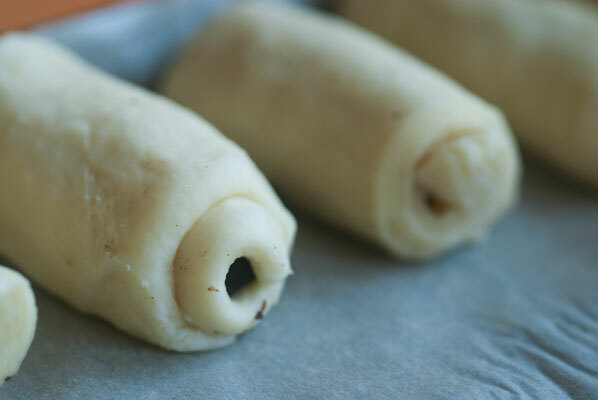 Repeat with other cake and remaining marzipan. 10. 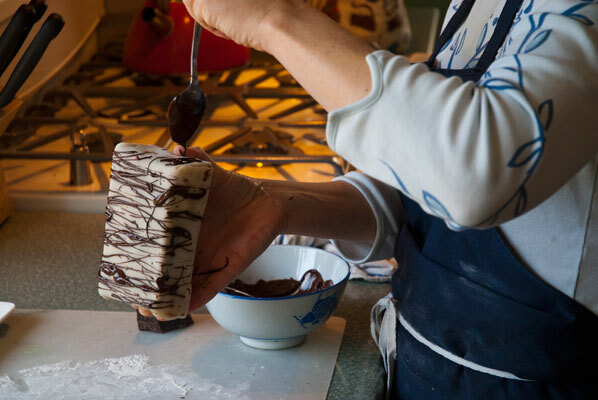 Now comes the fun and easy part: with a spoon or paper decorating cone, drizzle melted chocolate over the top and sides of the loaves in a lacy pattern. Chill uncovered for about 15 minutes. 11. Store in a cool place until ready to serve. Younger Son and I have been eating these loaves for several days now, and the flavour and texture are still very good. 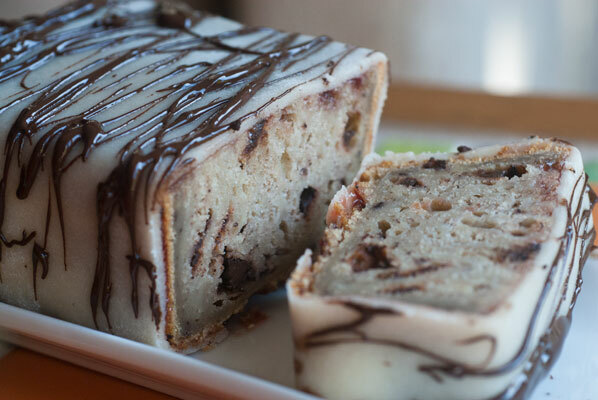 The chunks of dark chocolate and ground almonds make this loaf rich and hearty, and the jelly, marzipan and dark chocolate coating layers really make it special. Something you would serve on a holiday brunch table. Buoyed by the success of the Icelandic Potato Loaf (my partner is thrilled it uses potatoes, as we had a bumper crop, this year), it is time for the main event. 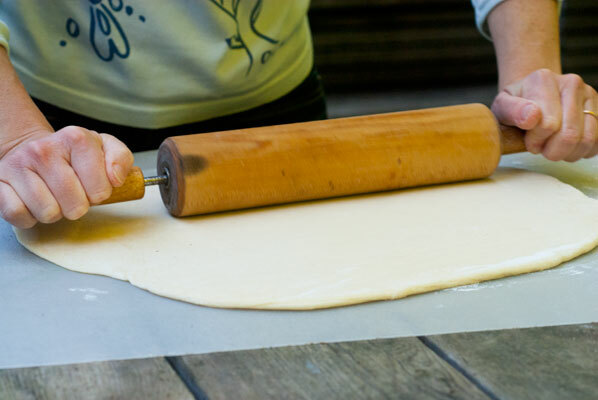 These gorgeous, over the top, buttery, flaky, delicate, oozing with chocolate beauties require a good rolling pin, time to chill the layers, the ability to fold up a business letter (yes, really) and an odour-free refrigerator to chill the dough between rolling. 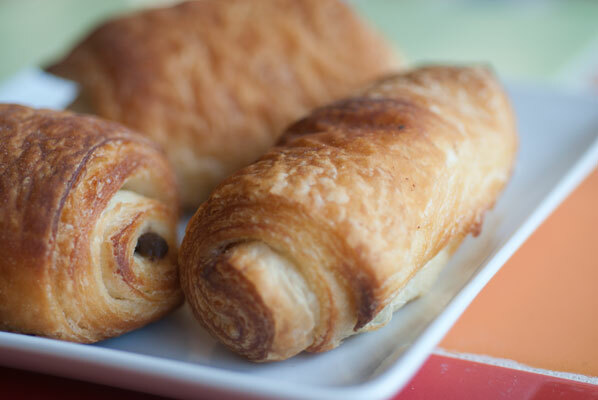 The pain au chocolat are surprisingly straightforward, and I am very grateful to Julie, and her blog Dinner with Julie, for her recipe. Oh, these are so good. I got thirty from the first batch, with a request for another batch, hot on its heels. They were devoured by everyone in my family, and will I think, be making a few starring appearances, not only as after school snacks, but at upcoming work events for both my partner and myself – I can think of no better way to impress my husband’s high powered clients than with chocolate, buttery goodness first thing in the morning. As for myself, I have a fast approaching first day of rehearsal for a brand new play. Traditionally on first day, there is what is called a “table read” of the script, accompanied by awful donuts and questionable coffee. I love “table reads”, even with the awful pastry, because they are the first time everyone comes together to hear the script. But how much better a way to start, as I swan into first rehearsal with these glorious bread-and-chocolate treats. 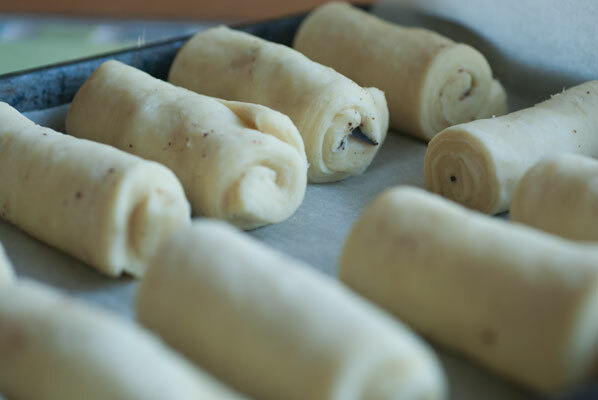 With these Pain au Chocolat, I think I can safely say that everyone’s performance will be just a little more inspired.